I've been asked this one so many times I decided to log it here so I can point people to it in future! The problem: You're looking up data in a table using INDEX and MATCH but the results aren't what you expect. MATCH has a third, optional parameter, which if you omit it defaults to a setting that (I bet) you don't want. The solution: You need to use zero as your third MATCH parameter. It's likely that somewhere in your cells you have a MATCH formula that doesn't have zero as the third parameter, so check all those. 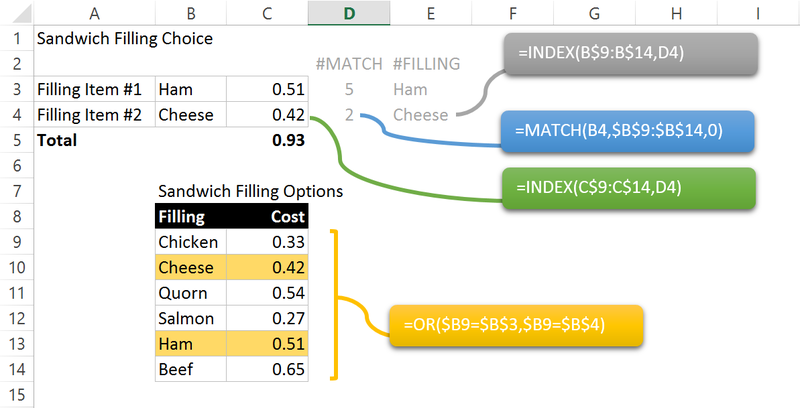 First, if you've got INDEX and MATCH in one long function, break it down so that you have separate cells calculating intermediate results [see blue and green formula boxes]. Essentially you want to keep breaking down the problem calculation until you can spot the error.